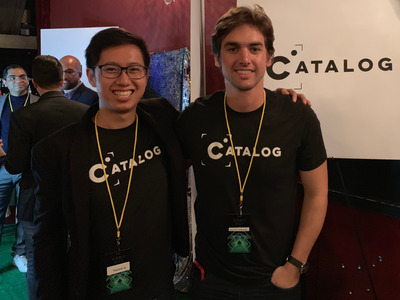 Patrick Ip, an ex-Googler who was involved in a Nobel Peace Prize nominated project, has a new startup called Catalogue. Ip and his co-founder Jacobo Lumbreras hope Catalogue can create steady work and full-time jobs for independent photographers around the country. Ip’s project at Google – One Billion Acts of Peace – didn’t win the Nobel Peace Prize, but has documented 53 million so-called acts of peace thus far. Meng’s idea would eventually lead to a Nobel Peace Prize nomination. On Wednesday, Patrick Ip announced the $US1.5 million funding led by Moonshot Capital for his new company – Catalogue – and it’s a slight departure from his Nobel Peace nominated work at Google. Ip, along with his co-founder Jacobo Lumbreras, created Catalogue to help small to medium-sized brands get unique, high-quality product photography at a lower cost than what was available before. One of Catalogue’s first customers – an all-natural cosmetics company named Naked Poppy – was quoted $US7,000 for 15 photos by an agency. Catalogue’s product shots, by contrast, only cost $US20 per photo. Ip said he saw the problem first hand while he was at Google. Not having quality photography was one of the top reasons smaller companies weren’t able to find success on Adwords – Google’s search advertising service – and ultimately left the Google platform. To achieve lower costs, Catalogue connects brands with independent photographers around the country. They hope their two-sided marketplace will create steady work for the photography community. If it can create more jobs for photographers and help small brands grow, Ip hopes that Catalogue could ultimately represent its own act of good. The project at Google – One Billion Acts of Peace – didn’t ultimately win the Nobel Peace Prize, but it did gain the support of 14 Nobel Laureates, including the Dalai Lama and Archbishop Desmond Tutu.